Edmund Comerford, Bishop of Ferns, who died on Easter Day, 8 April 1509, was the last pre-Reformation Bishop of Ferns. His immediate successors – Nicholas Comyn (later Bishop of Waterford and Lismore), John Purcell and Alexander Devereux – held office at the time of the Reformation, but while those three bishops are recognised by both the Church of Ireland and the Roman Catholic Church in their respective succession lists, Edmund Comerford is the last bishop common to both traditions before the divisions of the 16th century. Edmund Comerford was also one of the last bishops to wield vast and extensive powers as an ecclesiastical potentate in Co Wexford before Henry VIII limited the temporal influences of the Church. During his episcopacy, Comerford controlled ecclesiastical appointments throughout the south-east of Ireland – retaining a number of the more powerful and lucrative positions for himself throughout his time as bishop. He controlled castles and monastic establishments, he forged alliances with the leading political families, and he was part of the small circle that dominated civic and Church life in the region. Little has been written about Comerford’s life, his origins have been obscured by fanciful family myths, and some historians have even managed to get his name wrong. At the end of the 19th century, the historian of the Diocese of Ferns, W.H. Grattan Flood, claimed that “during the episcopacy of Bishop Comerford, nothing of any note happened.” Compared with other Church dignitaries born in Co Kilkenny, he gets little attention from Canon William Carrigan in his four-volume history of the Diocese of Ossory, published at the beginning of the 20th century. Hore, Leslie, Foster and, more recently, Raymond Gillespie, incorrectly name him as Edward Comerford, although he is named as Edmund Comerford in Cotton and Crockford, is called both Edmond and Edmund Comerford by Grattan Flood, and is named as Edmund Comerford by Carrigan. However, despite the claim by Grattan Flood that “during the episcopacy of Bishop Comerford, nothing of any note happened,” and the poor attention he receives from both Carrigan and Leslie, Edmund Comerford appears to have used his position and power to amass great private wealth. And, despite all previous indications in the Ormond Papers that Edmund Comerford was the uncle of William Comerford, it now appears that the young “nephew” who succeeded him as Dean of Ossory was the bishop’s own illegitimate son, and was imposed on Saint Canice’s Cathedral, Kilkenny, as dean in a series of acts of naked and brazen nepotism that defied not only the chapter of Kilkenny but the Vatican itself. Grattan Flood, Carrigan and Leslie were working before the Ormond Papers were edited by Edmund Curtis in the 1930s and the 1940s, and until the publication of the Calendar of Papal Letters by the Irish Manuscripts Commission at the end of the 20th century, much of the information about Comerford’s life and his ‘nephew’ came from either the Ormond Papers, or was distilled through information gleaned by Carrigan in the years after the publication of his history and still contained in his unpublished notebooks in the library of Saint Kieran’s College, Kilkenny. The difficulties in establishing the bishop’s family background were compounded by an official family tree registered in the Genealogical Office, Dublin, in 1724 on behalf of Joseph Comerford by Sir William Hawkins, Ulster King of Arms. That pedigree claimed that Bishop Comerford was the second son of ‘Fucus de Comerford’ of Danganmore, Co Kilkenny. However, the document has little to do with historical facts and more to do with the fanciful claims of this colourful 18th century merchant from Clonmel, Co Tipperary, and his pursuit of the titles of Baron of Danganmore and Marquis d’Anglure and his claims to kinship with the Comberford family of Staffordshire. This pedigree was dismissed in a pencilled note by George Dames Burtchaell, but has continued to cause difficulties for everyone researching Comerford family history, and its claims were accepted by Sir William Betham, Blake Foster and, apparently, even by the late Edward MacLysaght in More Irish Families. However, the publication of the Calendar of Papal Letters revealed the interesting, almost unsavoury, details of Bishop Comerford’s lifestyle, and make it possible to reassess the career of one of the most powerful potentates in the pre-Reformation Church in the south-east of Ireland and of the way ensured that his successor as the Dean of Saint Canice’s was his own son, once believed to have been his nephew. From documents dated only 11 years after his death, Edmund Comerford appears to have been closely related to the Ballybur family, and was, perhaps, a brother of Richard Comerford, who established himself at Ballybur in the early 16th century. In 1520, Edmund’s successor as Dean of Saint Canice’s, William Comerford, described himself as ‘heir of Richard and Edmund Comerford,’ but the only land-holding Richard Comerford of note in Co Kilkenny at the time was Richard Comerford (ca 1462-post 1532), who came into the possession of Ballybur, Co Kilkenny, through his marriage to Ellen Freny (or French), daughter and co-heir of Patrick fitzFulk Freny, and heiress of Ballymaclaphry and of the moiety of the manor of Ballymacuogue, Co Wexford. Richard Comerford ‘Senior’ was still living on 23 June 1532, then aged 70, and was the ancestor of the Comerford families of Ballybur, Kilkenny City, and Bunclody, Co Wexford. Edmund Comerford was educated at Oxford and entered the priesthood as an Augustinian friar. At first, he may have been attached to either the Augustinians at Saint John’s Hospital in Kilkenny, or their priory in Callan, his probable home town. Either house would have brought Edmund early connections with Co Wexford – during Comerford’s time, the Augustinians of Callan had close links with the Augustinians of Ferns: a Papal bull from Pius II in 1461 had entrusted the Abbot of Ferns with erecting an Augustinian house in Callan, following a petition by Sir Edmond Butler. 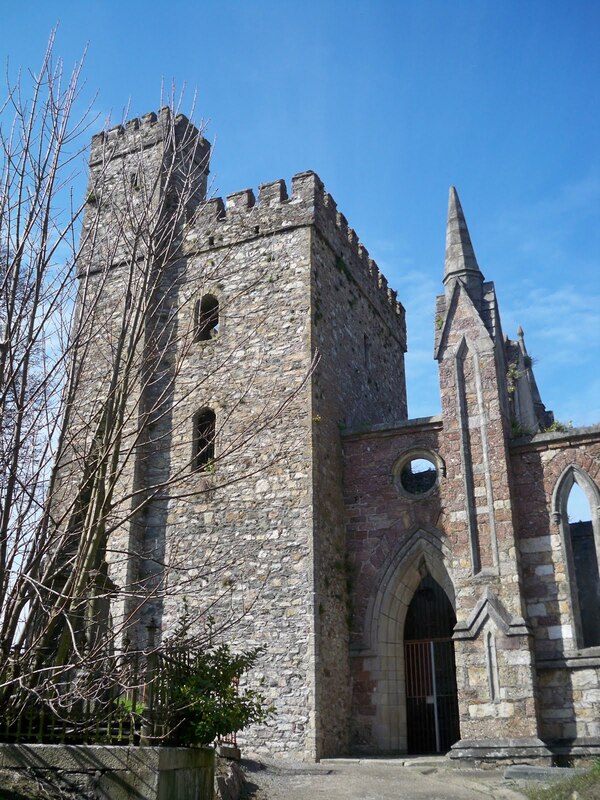 Sir Edmond died on 13 July 1464 and Callan Friary was completed by Sir James Butler, who in 1467 married Sabina or Saebh Kavanagh, daughter of Donal Fuscus or Donal Reagh Kavanagh of Enniscorthy Castle, King of Leinster. 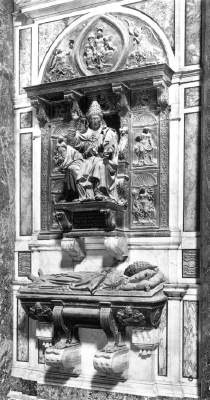 In 1486, Pope Innocent VIII notes in Saint Peter’s, Rome, that ‘Edmund Comortun’ had been made a canon in the chapter of Saint Canice’s Cathedral, Kilkenny, before 13 March that year. 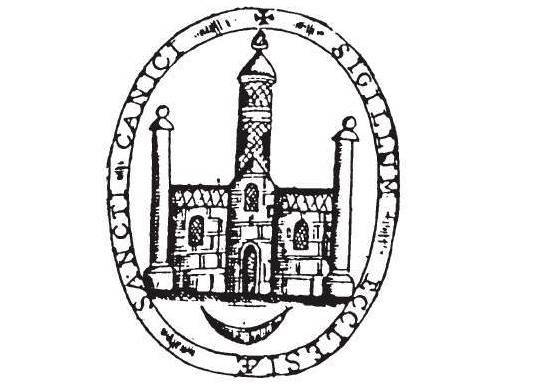 A year later, on 21 June 1487, Comerford became Dean of Saint Canice’s and Rector of Saint Martin’s or Tompugh. Leslie notes that the previous dean, Thomas Cantwell, had died of the plague. Edmund probably secured this appointment as Rector of Saint Martin’s because of his position in the Augustinian community: Saint Martin’s or Templemartin, three miles south-east of Kilkenny City, was connected with saint John’s since 1230, when the Priors of Saint John’s held the moiety of the church or rectory of Claragh, and in 1315 Bishop Richard Ledred of Ossory – better known as the bishop who placed Dame Alice Kytler on trial – had granted the vicariate of the church to Saint John’s Priory. The church has long since been torn down and the parish was incorporated with Claragh Parish. By now, Edmund was living unashamedly with an unmarried woman, whose name has not been passed down to us, and sometime before he became Dean, she gave birth to a son, William Comerford, who would later claim some of his father’s offices and seek respectability by disguising his origins and claiming Edmund was his uncle rather than his father. However, the child’s parentage probably remained secret for another few years, except in the files of the Vatican and the Lateran, and in the meantime there were more pressing allegations of corrupt ecclesiastical practice that Edmund was forced to overcome in his unremitting search for preferment and promotion in the ranks of the Church. Meanwhile, it was obvious that the dean was an unashamed pluralist. By 1491, we find Edmund Comerford, ‘Decanus ecclesiae Ossoriensis,’ adding to his ecclesiastical powers. Philip Purcell had obtained the patronage of the parish of Kulcrahyn or Coulcrahyn (Coolcraheen), with the right to appoint the Rector. However, Edmund challenged his claim, and on 13 August 1491 issued a certificate ad perpetuam rei memoriam of ordinance given before him respecting the rectory, and presented Sir John Archdeckyn (i.e., the Revd John Archdeacon), the Chancellor of Ossory, as rector. This is probably Coolraheen in Muckalee Parish, which belonged to the Canons Regular of Saint Augustine at Saint John’s Priory. Neither Archdeckyn nor his immediate predecessors, Sir Malachy O’Brenan, John O’Brenan and Walter Wydle, who were presented by Purcell, are named by Leslie. Although now a powerful figure in the affairs of both Church and State, Dean Comerford’s position was soon endangered when he was accused of involvement in the rebellion of Perkin Warbeck. 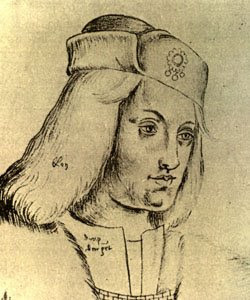 In 1493, he was ordered in Parliament to resign as dean and to surrender on 12 August on a charge of complicity in the rebellion of the Yorkist pretender who claimed to be Richard IV or Prince Richard, second son of Edward IV and the younger of the two ‘Princes in the Tower.’ Perkin Warbeck’s claims also impinged on the feuds between the Earls of Ormond and Kildare, but when Kildare’s supporters were removed from office and Ormond’s nominees replaced them, Comerford was able to survive the storms and eventually acquitted himself of the charges. Unbowed and unbloodied, Comerford extended his powers five years later by becoming Rector of Saint Mary’s, Callan, and Prior of Saint John’s, Kilkenny, on 3 March 1498, despite the claims of John Cantuel (Cantwell) and Dermot Oclere (O’Cleere), and assumed those offices on 24 May 1498. As Prior of Saint John’s, Edmund was now one of the most important Church figures in Co Kilkenny and Co Wexford, holding the right to appoint rectors and vicars to parishes throughout the dioceses of Ossory and Ferns. Since about 1227, the Priors of Saint John’s also possessed the churches of Saint Mary and Saint Evin, New Ross, although this had been contested by the Abbot of Tintern in 1308. In the Diocese of Ossory, as Prior of Saint John’s, he possessed the churches or parishes of Jerpoint, Saint John’s with Loghmetheran (Loughmerans, in Dunmore), Dromerthir or Drumerin in Kilmadum Parish, Kilmelag, Dunfert, Tibretbretayn (Tubridbritain), Kildreynagh (Kildrinagh), McCully (Muckalee), Castlecomer, and Scaethery (Skirke). As Dean of Saint Canice’s, his official residence was the Dean’s Castle in the townland of Deansground, near the present Archer’s Avenue, off the Castle Road, Kilkenny, with grounds extending to the site of Saint Joseph’s Convent; and he also possessed the Church of Saint Patrick’s and half the Church of Saint Mary’s, Kilkenny, and the Church of Athnyrle (now Urlingford). Comerford continued to hold the posts of Prior of Saint John’s and Dean of Saint Canice’s at the same time. On 18 March 1499 and 26 October 1508, he is described as ‘Dean of Saint Canice’s,’ and as ‘Dean of Ossory’ on 13 August 1491 and 6 January 1501. On the latter date, 6 January 1501, he was one of the senior Church figures in the ecclesiastical court case that legitimated the marriage in 1465 of James Butler and Sabina or Saebh Kavanagh from Co Wexford, daughter of Donal Reagh Kavanagh. Because of their close kinship and her previous marriage, there were two impediments to this marriage, and the court case in Saint Canice’s, at which Comerford was a key figure, resulted in Edmund and Theobald Butler, the sons born to James and Sabina before the marriage being deemed illegitimate, so that the Ormond succession passed eventually to a younger son, Piers Butler, 8th Earl of Ormond, in 1515. Comerford’s role in finding a legal solution that legitimised the Ormond claimants is interesting, for Papal officials in Rome already knew that Edmund himself had been living with a woman who was in effect his wife and the mother of his child, and they allowed him to petition for a dispensation allowing his young son William to be ordained to the priesthood. 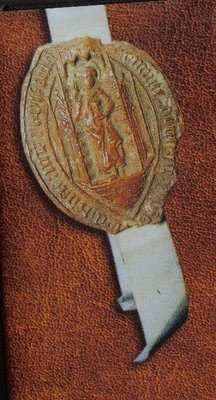 On 14 May 1502, a mandate was issued in the Papal Court in the Lateran to the Prior of Inistioge, the Dean of Waterford, and Robert Heydan, a canon of Cashel Cathedral, in which the Papal authorities gave instructions that William Comerford was to succeed Maurus Olealonyr (Maurice Lalor) as Rector of the Parish of Culcrahyn, and the parish was to be made a prebend for his personal benefit in Ossory Cathedral. So, despite the unfolding scandal about Edmund Comerford’s domestic arrangements, his son William was given a lifetime sinecure as a canon in the chapter of the cathedral where his father was the dean, and he was to become the rector of the parish that Edmund Comerford, as Dean of Ossory, was found unashamedly holding onto in 1491 despite the claims to patronage by Philip Purcell, and on which Edmund had managed to impose John Archdeacon as rector. It was a blatant case of nepotism, corruption and disregard for the moral standards of the day, but it appears to have done little damage to the dean’s personal, political and ecclesiastical ambitions. Despite the knowledge in Rome of these scandalous details about his family life, Edmund now appeared to be unassailable as one of the most powerful figures in the Church in the south-east. And so, when Lawrence Neville died in 1503 after 24 years as Bishop of Ferns, Edmund, as the leading Augustinian in the region, and as patron of Saint Mary’s, the diocese’s effective cathedral in New Ross, was now powerful enough to secure his own appointment as Bishop of Ferns. In 1403, the Bishop of Ferns, Patrick Barret, who was a Kilkenny Augustinian and a Canon Regular of Kells, had obtained Papal permission to transfer the sedes episcopalis or bishop’s seat from Ferns to New Ross, effectively abandoning Saint Edan’s in Ferns and making Saint Mary’s in New Ross the most important church in the diocese. Barret combined spiritual power with temporal power, being both the Bishop of Ferns and Lord Chancellor of Ireland, and 1409 he rebuilt Mountgarret Castle as his official residence. Originally built by Roger Bygod, Earl of Norfolk, this castle occupied a strategic commanding site that overlooks New Ross. On 11 April 1505, there is a reference in the Vatican Registers to ‘Edmund Chimunfurt’ in Kilkenny ‘who claims to be a cleric’ and who is holding the deanery of Ossory. However, there were no questions about Edmund’s clerical status, and within weeks he had been appointed Bishop of Ferns. He was consecrated bishop not in Saint Edan’s Cathedral, Ferns, nor in Saint Mary’s Church, New Ross, but in Saint Canice’s, his own cathedral in Kilkenny. Not surprisingly, he continued to hold office both as Dean of Saint Canice’s and as Prior of Saint John’s, Kilkenny, throughout his episcopacy. We find him as Prior of Saint John’s between 22 August 1506 and 22 August 1507, and as Dean of Saint Canice’s on 25 and 26 October 1508. As Bishop of Ferns, Edmund Comerford was an influential figure in Wexford Town. One Pope, writing to an earlier Augustinian Bishop of Ferns, Geoffrey Groffeld, referred to Wexford ‘which is almost at the end of the world in Ireland.’ Nevertheless, a number of mediaeval bishops of the diocese have been described as ‘Bishop of Wexford,’ or even, in one instance, as ‘Archbishop of Wexford,’ and synods for the Diocese of Ferns were held occasionally at Selskar Abbey in Wexford, while Parliament sat in Wexford in 1462-1463, and again in 1464. In the first half of the 16th century, there are references to Saint Patrick’s Church as a cathedral church. Standing in Saint Patrick’s Square at the end of High Street, Wexford, Saint Patrick’s was the largest of the pre-Cromwellian churches in the town and was an appropriation of the Augustinian foundation at Selskar. And so, with its prominence, and strong ties to the Augustinian bishop of the diocese, it might well have served this Augustinian bishop as a diocesan cathedral. Grattan Flood notes that the sedes episcopalis was transferred at an early stage from Ferns to Wexford, and from the late 16th or early 17th century to this day Wexford has been a mensal parish for the Roman Catholic bishops of the diocese. But even if Comerford did spend time in Wexford – ‘which is almost at the end of the world’ but was the principal town of the country – New Ross was the principal port for Kilkenny, where Edmund was still Dean. 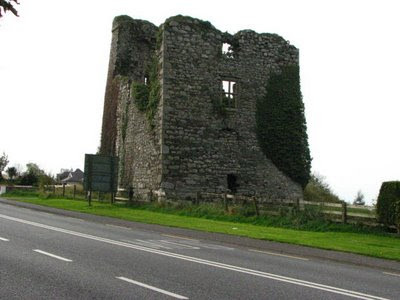 Therefore, we can surmise that he spent most of his episcopacy living at Mountgarret Castle, near New Ross, and at Fethard Castle, the principle residences of the Bishops of Ferns since the early 15th century. Both the manor and the church of Fethard belonged to the Bishops of Ferns and had been confirmed to them in 1245 and again in 1308. From the 15th century, Fethard Castle was the summer residence of the bishops, and later Bishop Alexander Devereux died there in July 1566. Edmund Comerford remained Bishop of Ferns for less than four years. 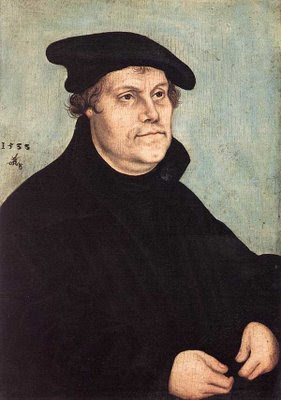 But his term of office coincided with the beginning of stirring events – in 1507, his fellow Augustinian, Martin Luther (1483-1546), was ordained to the priesthood. That year, on 14 January, Edmund Comerford was one of the senior ecclesiastical figures involved in the case hearing a dispute between the Prior of Kells, Co Kilkenny, and the Prior of Kilmainham, Dublin. On 26 January 1507, as Bishop of Ferns and Prior Commendatory ‘of the House and Hospital of Saint John the Evangelist near Kilkenny,’ Edmund issued a grant of land in Magdalene Street, Kilkenny, and of large meadows near the site of the present railway station in Kilkenny to the Revd Philip Walsh, chaplain of Saint Peter’s Chantry in Saint Mary’s Church, Kilkenny, and his successors. The seal attached to this grant, which still survives among the charters and civic records of Kilkenny City in the Tholsel, is that of Edmund Comerford as Prior of Saint John’s rather than as Bishop of Ferns. Within six months, there was a false rumour that Comerford had died and on 3 August 1507, Nicholas Comyn was appointed Bishop of Ferns. Comerford was very much alive, however, and Comyn had to wait two more years before succeeding him in Ferns. Meanwhile, because of minor disputes in the Dioceses of Ossory and Ferns, it emerged once again that Papal officials in the Lateran knew of the scandalous details of Edmund’s domestic life. In the Diocese of Ossory, a dispute had arisen once again in November 1506 over the parish of Coolraheen, where William Comerford was still the Rector. Once again, Edmund was asked by the Lateran to adjudicate in the dispute, although it must have been obvious to all that the bishop was going to find in favour of his own son. In the Diocese of Ferns, the dispute arose over who was the rightful incumbent (parish priest or rector) of the parishes of Kilrnys (?Kilrane) and Saint Cormac (Kilcormack) in Co Wexford. In a mandate to a number of senior ecclesiastical figures in both Ferns and Ossory aimed at settling these disputes, the Papal officials admitted that one of these officials, Canon William Comorthyn (i.e., Comerford), had received an apostolic or papal dispensation some years earlier allowing him to be ordained to the priesthood although he was the son of an unmarried man and an unmarried woman. Canon William Comerford and the other officials were ordered to summon Bishop Edmund Comerford and the Chapter of Ferns so that the disputed parishes could be wrested from Thomas Val (Wall) of the Diocese of Waterford and given to one William Lassi (Lacy). Here again, the nepotism was blatant, with William Comerford being asked to invite his own father to adjudicate in an ecclesiastical court. Pope Alexander VI ordered Walter Weslelley, a canon of Kildare Cathedral, and two canons of Ferns, Donald Lacy and James Machduyll (Doyle) to summon ‘Bishop Edmund and others concerned.’ But in another concession to an already corrupt administration, although they were to remove Edmund from office, they were to hand over the position of Dean to ‘William Qum’ford’ (i.e. Comerford), a canon of Ossory. However, the Vatican recognised that there were three difficulties in removing Edmund and replacing him with this other member of the family: William Comerford was still a minor, there were questions about whether he had been validly ordained because he was underage, and once again it emerged that William was also the illegitimate son of Edmund Comerford and an unmarried woman, born when Edmund was still only a canon of Saint Canice’s. Pope Alexander VI now moved to remedy any defects and gave William yet another papal dispensation, allowing him to be tonsured and ordained should he have reached the canonically legal age. These concessions appear to have been retrospective in their application; it was agreed William was to be installed as a canon and a prebendary of Kilkenny Cathedral and the Pope decreed that despite ‘the defects of birth and of age,’ William should be installed as Dean of Saint Canice’s ‘immediately’ and given the other dignities and at least two parishes to ensure he had a proper income to accompany the dignity of his new ecclesiastical offices. 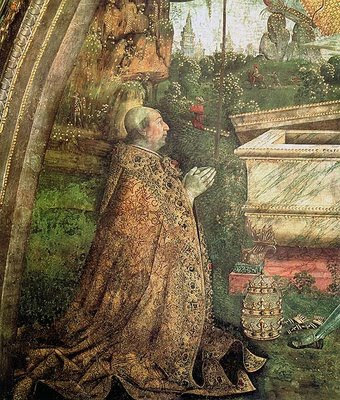 William was not bound to be ordained to the priesthood for a further seven years, provided that within two years he became a subdeacon, although this too may have been merely a retrospective clause in case of any irregularities in William’s previous preferments, and he was allowed not to reside in any of the parishes he acquired while he was studying at university. On an initial reading, it might seem that the case of the bishop and his illegitimate son had been brought to the attention of the Vatican by outraged, jealous or rival Irish clergy, hoping to remove Edmund Comerford from some of the many offices he had accumulated during his career. However, this is unlikely, for the astonishing fact remains that only weeks before his death Bishop Edmund Comerford had obtained Papal approval for passing on the office of Dean of Saint Canice’s, which he had retained illegally, to his own illegitimate son, a bewildering feat of hereditary churchmanship that would have shocked Edmund’s fellow Augustinian, Martin Luther, and others demanding reform of the Church at the time. Within months, Bishop Comerford was dead – he died on Easter Day, 8 April 1509. Edmund Comerford was succeeded as Bishop of Ferns by Nicholas Comyn, who was eventually consecrated in Saint Paul’s Cathedral, London. Comyn was transferred to Waterford in 1519, two years after Luther protested publicly against the sale of indulgences and nailed his 95 Theses to the door of the church in Wittenberg. 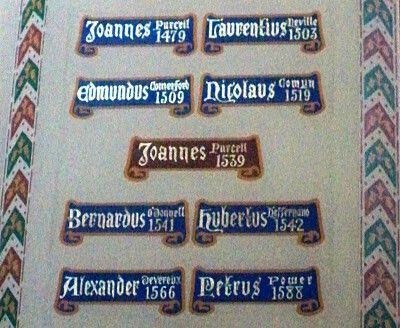 Both Comyn and his successor as Bishop of Ferns, John Purcell, were members of the Reformation Parliament that opened in Dublin in 1536, and also sat in Cashel, Kilkenny and Limerick. Bishop Purcell was one of the Lords Spiritual in this parliament, which passed an act in 1537 severing the Pope’s connections with the Irish Church and confirming the powers of Henry VIII, and did not die until 20 July 1539. Nicholas Comyn was also a member of this parliament, and remained as Bishop of Waterford and Lismore until 1551, when he resigned due to old age and infirmity. And so, we can truly describe Edmund Comerford as the last pre-Reformation Bishop of Ferns, accepted by both the Church of Ireland and the Roman Catholic Church. Edmund Comerford’s successor as Prior of Saint John’s, Kilkenny, appears to have been James Shortall, while his son William Comerford had already succeeded him as Dean of Saint Canice’s. As William’s successor, Dean James Cleere, is not named until 1539, William Comerford appears to have held office for almost 30 years, between 1509 and 1539. In 1520, 11 years after the death of Bishop Edmund Comerford, his son William Comerford described himself as heir or Richard Comerford and Edmund Comerford. On 9 August 1520, Richard Comerford and William Comerford, Dean of Saint Canice’s, son of Philip Comerford and heir of Richard Comerford and Edmund Comerford, admitted themselves bound to Piers Butler, 9th Earl of Ormond, in £100 Sterling. Four seals are attached to this document, which has been kept in the Ormond collection of papers, and which provided the first real historical clues to Edmund Comerford’s family connections – unlike the family tree composed for Joseph Comerford 200 years later there were no references to any ‘Fucus de Comerford’ of Danganmore, real or imagined, but neither was there any acknowledgment that William Comerford was the illegitimate son of the Bishop of Ferns. This essay includes information first published in my paper, ‘The last pre-Reformation Bishop of Ferns and his ‘nephew’, the Dean of Ossory,’ Journal of the Wexford Historical Society, No. 20 (2004/2005), pp 156-72. WH Grattan Flood, ‘The Episcopal City of Ferns,’ Irish Ecclesiastical Record, vol 6, July-December 1899, p. 165. William Carrigan, The History and Antiquities of the Diocese of Ossory (4 vols, Dublin, 1905), passim. John Foster, Alumni Oxoniensis 1500-1714 (London, 1892), vol 1, p. 314; Raymond Gillespie, ‘St Canice’s Cathedral in an age of change, 1500-1560,’ in John Bradley, Diarmuid Healy, Ann Murphy (eds), Themes in Kilkenny’s History (Callan, 2000), pp 47-56; PH Hore, History of the town and county of Wexford (6 vols, London 1900-1911), vol 6, p. 215; JB Leslie, Ossory Clergy and Parishes (Enniskillen, 1933), p. 57. Three years later, Leslie names him correctly as Edmund, see JB Leslie, Ferns Clergy and Parishes (Dublin, 1936). Henry Cotton, Fasti Ecclesiae Hibernicae (Dublin, 1848), vol 2, pp 293, 334; Crockford’s Clerical Directory (London, 1971-1972 ed. ), p. 1420; WH Grattan Flood, History of the Diocese of Ferns (Waterford, 1916), pp xi and 226; see Carrigan 3, p. 252. Genealogical Office Dublin,, Mss No 160, ff 102-104. The pencilled note in Burtchaell’s hand reads: ‘All this is pure and unadulterated rubbish.’ G.O. Mss No 160, f. 102. See Edward MacLysaght, More Irish Families (Dublin, 1960), p. 63. Calendar of Papal Letters relating to Great Britain and Ireland, vol 19, 1503-1513, Julius II Lateran Registers, Part 2 (ed MJ Haren, Dublin, 1998) # 75, pp 40-41. Carrigan 3, pp 393-394; Healy 1, p. 61; Burke’s Peerage, various eds., s.v. de Freyne (1851). Foster i, p. 314; AB Emden, A Biographical Register of the University of Oxford to AD 1500 (Oxford, 1957), p. 475 (although he says Anth Woods gives no authority for this statement); Cotton 2, pp 293, 334. Grattan Flood (1899), p. 169. Calendar of Entries in the Papal Registers Relating to Great Britain and Ireland, Papal Letters, vol 14, 1484-11492, ed. JA Twemlow (London, 1960), p. 117. Carrigan i, p. 237, iv, p. 333; Carrigan Mss, notebook dated 1920 (National Library of Ireland, Dublin, microfilm Pos 909), f. 52. Comerford is not named in Leslie’s list of the Vicars of Saint Martin’s (see Leslie, Ossory, p. 352), but Leslie points out that the Vicars Choral of Saint Canice’s served in turn as vicars of this parish and that the rectory was impropriate in the Vicars Choral. In the Church of Ireland, the parish is now part of Kilkenny Union, with the dean as rector. See Ormond 4, p. 60; RJ Hayes (ed), Manuscript Sources for the History of Irish Civilisation (Boston, 1965), 1, p. 655. Ormond 3, pp 269-270; Carrigan 1, p. 237; 2, pp 147, 197; 3, pp 251, 453; 4, p. 333; Leslie, Ossory, pp 57, 83, 234; Hayes 1, p. 653. Carrigan Mss, loc. cit., Calendar of Papal Letters Relating to Great Britain and Ireland, vol 18, Part 1, 1495-1503, Alexander VI (ed. AP Fuller, Dublin, 1994), # 575, p. 369, citing Reg. Lat. 1093, fols 391v-394v. 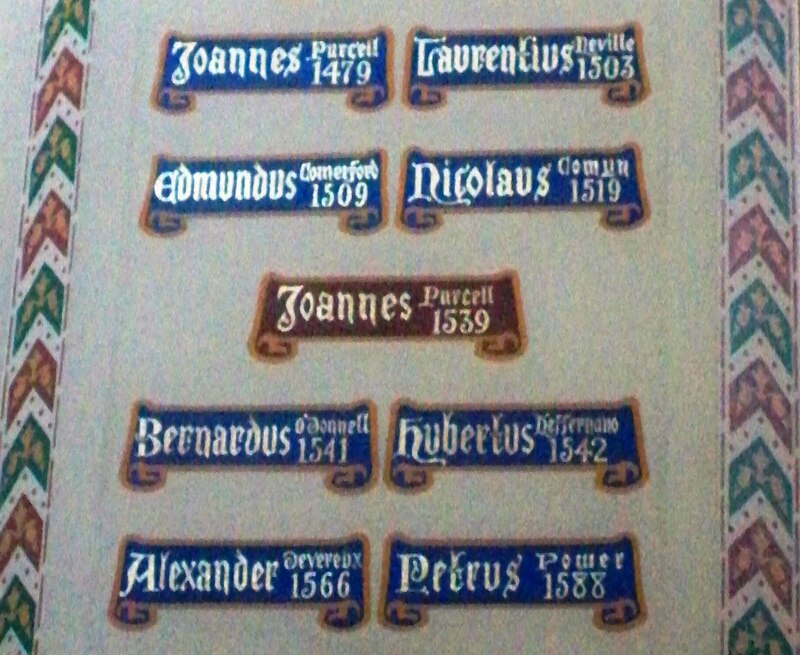 Cantwell, Oclere and Comerford are not listed by Leslie in the rectors and vicars of Callan, although Sir Dermot O’Clery was vicar in 1510 and very old; Cantwell is probably the same John Cantwell who became Precentor of Ossory and died on 18 November 1531 (Leslie, Ossory, pp 212-213). Carrigan 1, p. 237; 3, pp 250-251; Grattan Flood (1916), p. 83; Una Hughes, ‘In the Borough of St Kenny (2),’ Old Kilkenny Review, No 55 (2003), p. 115. Leslie, Ossory, p. 57; Calendar of Ormond Deeds 3, pp 269-270, 296-299, 329. Ormond 3, pp 296-299; Lord Dunboyne, ‘The next Earl of Ormond?,’ Journal of the Butler Society, vol 14 No 2 (2000), p. 213. Cal Pap Lett 18, Part 1, # 645, p. 405, citing Reg Lat 1098, fos 109r-110r. Neither Oleanlonyr nor Comerford is mentioned by Leslie in reference to this parish, see Leslie, Ossory, p. 234. Cal Pap Lett 18, Part 1, # 645, p. 405, citing Reg Lat 1098, fos 109r-110r. Hore 1, pp 86, 93 n. 3, and 217 (although Hore gives the date of transferral as 1400); Grattan Flood (1916), pp 28, 83, 87 (he gives the date of transferral from Ferns to New Ross as 1408, see pp 28, 83). Hore 1, p. 114, n. 3; Grattan Flood (1916), p. 85. Calendar of Papal Letters Relating to Great Britain and Ireland, vol 18, Pius II and Julius II, Vatican Registers (1503-1513), Lateran Registers (1503-1513) (ed. MJ Haren, Dublin, 1989), # 21, p. 20, citing Reg. Vat. 901, fos 65v-71v. Cotton 2, p. 334; Grattan Flood (1916), p. xi; Grattan Flood (1899), pp 172-173; Cal Pap Lett 19, # 2031-2032, p. 596. ibid., p. 237; iv, p. 333; Ormond 3, pp 329; Leslie, Ossory, p. 57, quoting Ormond Mss then in Kilkenny Castle; Hayes 1, p. 653. Calendar of entries in the Papal Registers Relating to Great Britain and Ireland: Papal Letters, 1198-1304 [&c.], (London and Dublin, 1893-), vol 3, p. 565; Leslie, Ferns, p. 255; Nicholas Furlong, Loch Gorman and Wexford (Wexford, 1985), p. 1. See Hore 5, pp 38, 249; Grattan Flood (1916), p. x; Leslie, Ferns, pp 1 ff (see, for example, 1169, 1178 and 1186). See Leslie, Ferns, p. 249. Grattan Flood (1916), p. 125. Billy Colfer, Arrogant Trespass (Enniscorthy, 2002), pp 219-220. Compare Grattan Flood (1916), p. 140, who gives the dates 1479-1510, with Leslie, Ferns, p. 22, who gives the dates 1480-1531. Grattan Flood (1916), pp x and 140; Leslie, Ferns, p. 22. NB White, Irish Monastic and Episcopal Deeds, AD 1200-1600 (Dublin, 1936), pp 55-63. John Bradley, Treasures of Kilkenny (Kilkenny, 2003), pp 108-109. Grattan Flood (1916), p. xi. Cal Pap Lett 18# 616, citing Reg. Lat. 1180, fos 313r-315r. Comerford is not listed by Leslie for this parish, see Leslie, Ossory, p. 234. Cal Pap Lett 18 # 783, p. 540, citing Reg. Lat. 1194, fos 312r-316v. Grattan Flood (1899), p. 172. Cal Pap Lett 18 # 75, p. 40, citing Reg. Lat. Grattan Flood (1899), pp 172-173; Grattan Flood (1916), p. xi; Leslie, Ossory, p. 57; Cotton 2, p. 334. Grattan Flood (1916), p. 89. Leslie, Ferns, p. 5; Crockford (1971-1972 ed. ), p. 1421. Carrigan 3, p. 253; Carrigan Mss, loc. cit. Leslie, Ossory, p. 57; see Calendar of Ormond Deeds, vol 3, p. 321, where William is Dean of Saint Canice’s on 7 February 1523. Ormond, vol 4, p. 60; Hayes 1, p. 655. © Patrick Comerford, 2009, 2010, 2011, 2013. Latest updates: 2 January 2009; 17 August 2009; 27 October 2009; 15 April 2010; 26 April 2010; 19 November 2010; 6 March 2011; 7 June 2011; 13 April 2013. Fascinating post Patrick. Is there any online copies of Joseph's family tree online? Do you have a family tree online?